Glenna Blomquist has lived in Florida for 15 years and is still exploring what it is to be a "Floridian". Now retired, she has time to recollect and time to experience each moment as new. So she writes, weaving her childhood appreciations into the experience of her older self, offering up lyrical pieces with universal appeal. The large amoeba is writhing in the kitchen. It has no nucleus, yet. No discernible features to give a point of orientation. It seems to have legs that circle about under its pale flesh. I am entranced by its movement. Something is living in the house. Slowly it turns from skin too dry and dusty to imagine anything palatable, to a glossy, slimy thing that I begin to adore with rising excitement, as I peer at it through a small windowpane. Carefully I open the door to the compartment, and tentatively poke the creature. I leave no impression. Just what I want. My imagination runs wild of all the possibilities this blob has brought me today. After all, it is my creation that now has a life of its own. I will let it be, to rest, to decide who it is. To grow toward some type of identity. But there is more at work here. Tiny branches are finding their spiny way within my creature, pushing up and around, pushing pushing. Oh sweetness, that is what it seeks. The branches hide from the summer air, seeking a molecule or two of sustenance to feed their clandestine activities. Double, double, toil and trouble. I am the witch today, stirring up this batch of divine trouble, right here in my own kitchen. As I watch in fascination the doubling, I get a waft of sweet liquor, reminiscent of the finest Chardonnay. I could stand here and inhale deeply through the morning, until I am fully satisfied. But I won’t, as I have to make a decision, now, apparently. I am called by its restlessness to consider the complexity of my invention. What to add to the pot – to my wicked brew – to this experiment. Raisins, nuts, cheese, apricots. No--just pick one. Raisins will be good, in abundance. I toss them at the gyrating, copious, sticky animal opening its jaw to me. Swipe swipe, dash, dash, its squiggly feet swirl against the raisins, lumping and bumping along the way, until all are invisible except for small dots of black periodically surfacing. I have no patience with my fabricated child. But children take time to grow, pausing at some stages of life to rest while energy gathers for another spurt. It is the same with my child, now growing again to meet its destiny. It is time. Time to see the butterfly emerge. Its chrysalis will bring forth the mature, the final form, that will rise forth to feed hungry mouths. 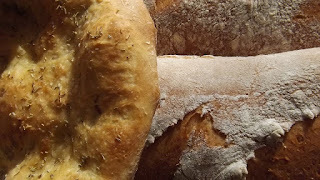 Only a short time to see what I have done today, in my kitchen, with my bread machine. As I gently tap out the beautiful loaf of bread, I think of the happy time I spent with this “animal” this morning. Dead flour became alive, not in my hands, but mechanically, as I watched each glorious pass of the beating legs. It’s a precise process, all ingredients weighed and layered in careful order. I have practiced much. I am proud. This child has been a latch-key child, but looking at the result, it’s okay. More than okay – rather, it’s delicious!